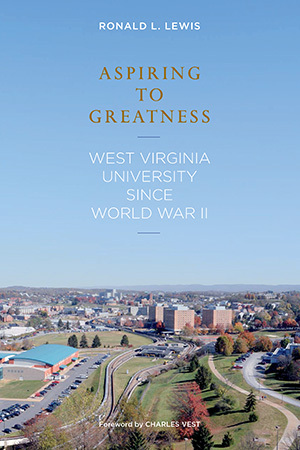 Aspiring to Greatness: West Virginia University since World War II chronicles the emergence of WVU as a major land-grant institution. As a continuation of the work of Doherty and Summers in West Virginia University: Symbol of Unity in a Sectionalized State, this book focuses on the modern historical developments that elevated WVU from a small regional institution to one of national prominence. West Virginia University’s growth mirrors the developmental eras that have shaped American higher education since World War II. The University’s history as an innovative, pioneering force within higher education is explored through its major postwar stages of expansion, diversification, and commercialization. Institutions of higher education nationwide experienced a dramatic increase in enrollments between 1945 and 1975 as millions of returning World War II and Korean War veterans took advantage of the GI Bill of Rights. Their children, the “baby boom” generation, continued to supply the growth in college enrollment and the corresponding increase in institutional complexity until the mid-1970s. During this period WVU followed the national trend by growing from a few thousand students to nearly fifteen thousand. From 1975 to the early 1990s, expansion gave way to diversification. The traditional student population stopped growing by 1975, and “boomers” were replaced by students from nontraditional backgrounds. An unprecedented gender, racial, and ethnic diversification took place on college campuses, a trend encouraged by federal civil rights legislation. To a lesser degree WVU was no exception, although its location in a rural state with a small minority population forced the University to work harder to attract minorities than institutions in proximity to urban areas. The commercialization of higher education became a full-fledged movement by the 1990s. Major changes, such as globalization, demographic shifts, a weak economy, and the triumph of the “market society,” all accelerated the penetration of business values and practices into university life. Like other public universities, WVU was called upon to generate more of its own revenues. The University’s strategic responses to these pressures reconstructed the state’s leading land grant into the large complex institution of today. As the only modern history of West Virginia University, this text reaches into the archives of the President’s Office and makes exhaustive use of press accounts and interviews with key individuals to produce a detailed resource for alumni, friends, and supporters of WVU, as well as administrators and specialists in higher education. Ronald L. Lewis received the BA degree from Ohio University in 1966, and from the University of Akron earned the MA (1971) and PhD (1974) in American history. He taught at the University of Delaware for eleven years (1974-1985) prior to becoming professor of history at West Virginia University in 1985. At WVU he offered undergraduate and graduate courses in American labor, West Virginia, and Appalachian history. He served as department chair for six years (1989-1995), was appointed Eberly Family Professor of History (1993-2001), and then Stuart and Joyce Robbins Chair in History (2001-2008), a position he held until his retirement in 2008. He is currently professor emeritus and Historian Laureate of West Virginia. His publishing career includes numerous journal articles, book chapters, and essays, along with fourteen co-edited books that include Transnational West Virginia: Ethnic Communities and Economic Change, 1840-1940 (WVU Press, 2002). In addition to Aspiring to Greatness, he is the author of: Coal, Iron, and Slaves: Industrial Slavery in Maryland and Virginia, 1715-1865 (1979); Black Coal Miners in America: Race, Class, and Community Conflict, 1780-1980 (1987); Transforming the Appalachian Countryside: Railroads, Deforestation, and Social Change in West Virginia, 1880-1920 (1998); and most recently Welsh Americans: A History of Assimilation in the Coalfields (2008). Charles Vest, President Emeritus and Professor of Mechanical Engineering at the Massachusetts Institute of Technology, was a native of Morgantown, West Virginia. Dr. Vest earned a B.S. in mechanical engineering from West Virginia University in 1963, and M.S.E. and PhD degrees in mechanical engineering from the University of Michigan in 1964 and 1967, respectively. He served on the boards of several non-profit organizations and foundations devoted to education, science, and technology, including the West Virginia University Board of Governors. He authored a book on holographic interferometry, and two books on higher education. He received honorary doctoral degrees from seventeen universities. He was awarded the 2006 National Medal of Technology by President Bush and received the 2011 Vannevar Bush Award from the National Science Board.